In the past six months, reports from the Canadian Manufacturers and Exporters, the C.D. Howe Institute, the Association of Major Power Consumers of Ontario, the Canadian Federation of Independent Business and the Ontario Chamber of Commerce have all called for “competitive” electricity prices. A few of the members of some of those associations already benefit from absorption of some costs by residential and small business ratepayers, but still complain their electricity bills are too high and not competitive with competing jurisdictions in Canada and the U.S.! Ontario is cursed with probably the most complex electricity system in the world even though 80% of our electricity is generated by nuclear and hydro. Both of those generation sources produce power at an average of about 6-7 cents per kilowatt hour (kWh), yet Ontario’s delivered electricity prices are among the highest in North America. Why? I just left a comment on an article at the Globe and Mail with the topic of importing power to Ontario from Labrador- which I’ll post below. Yesterday the National Post broke a story about Ontario looking to import electricity from Labrador. There are lots of ugly aspects to the tale, and some interesting ones – but it’d require a lot of time to examine a “promise of cheaper, cleaner power [that] is, in effect, nothing more than a distraction, a promise that will never be fulfilled” – as Terence Corcoran aptly describes it. My comment in the Globe criticized the Minister of Energy’s nonsense spin on saving money by not utilizing the natural gas fueled power plants contracted since the election of the Liberal party in 2003. If you believe Mr. Ciarelli is an honest man, it’s not that he doesn’t understand the system inherited, but that he doesn’t know the system his government created. Aerial view of the Diablo Canyon Nuclear Power Plant. 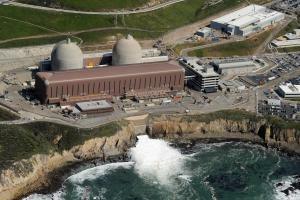 This month the US Nuclear Regulatory Commission (NRC) kicked off the restart of the license renewal for the twin 100 MW Westinghouse PWR type nuclear reactors at the Pacific Gas & Electric (PG&E) Diablo Canyon site located on California’s Pacific Ocean coast 200 miles north of Los Angeles. Green groups see the development of an environmental impact statement (EIS), required as part of the license renewal decision process, as a key opportunity to raise two sets of issues. The first is seismic safety and the second is a demand for the plant to go from an open loop to closed loop cooling system by building cooling towers. It’s about time – at best; it may be too late.